East Hampton attorney Joe Giannini, 74, is having his fifth life, by my count. He’s been a champion college wrestler, a life-long surfer, a Marine in Vietnam, a criminal lawyer for 40 years in New York, a boxing manager and promoter, and now, for his fifth curtain call, he is taking stock of his earlier incarnations. In collaboration with an editor, Jennifer Farbar, he is writing short stories detailing his life as an officer of rifle platoon in the Marine Corps in Vietnam, and as a criminal defense attorney, who defended clients in murder, drug, and mob cases. In the mid-sixties, “Operation Hades” was a US government program designed to defoliate the jungles in Vietnam, hopefully to turn the landscape of Vietnam into a desert, making it easier for American troops to fight the North Vietnamese, and to make sure the Vietnamese never recovered. 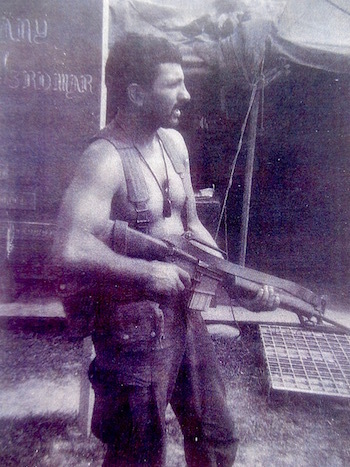 Mr. Giannini was a Marine infantry officer, a platoon commander in Vietnam from 1967 to 1968. They knew the American government was spraying defoliants, he told me, and the Marines went into the areas where they used it and were exposed to it. They called it “Agent Orange,” he tells me, because the chemical came in huge metal 55 gallon drums, which had orange stripes around them. Soldiers and marines would cut the drums in half to make barbecues or showers. They would even store water in them. Although there were many chemical companies manufacturing Agent Orange, Dow included, Monsanto was the major supplier for the government’s “Operation Ranch Hand,” which sprayed six million acres of forest in Vietnam, using 19 million gallons of defoliant. He didn’t figure out until years later that the lesions were caused by wading up to their chests in contaminated water in rice paddies and streams. Mr. Giannini, who now lives in East Hampton, was born in Brooklyn, and raised in Nassau County. Two months after graduating from Hofstra University, he went to the Army induction center to enlist in the Army before they enlisted him. The Marine Corps, Mr. Giannini told me, was really the defining experience of his life, because of what he learned about human nature and himself. Back in 1966, going through training at Paris Island, South Carolina, was a brutal thing. Mr. Giannini took me on a tour of ‘Joe’s World,’ his very large basement filled with artifacts from all the different eras in his life. “When we came back from the war, we surfed a lot,” he tells me, showing me some vintage boards, including a classic Morey-Pope board, a “Machine” from the ‘60s. “We were healing ourselves, though we didn’t know it at the time,” says Mr. Giannini. At the entrance is “a shrine, I guess you’d call it,” Joe said, laughing, as he showed me a bronze statue of Marines raising the flag at Iwo Jima; photographs including a fellow Marine, killed in battle; with his current wife; some of his medals; a Snoopy doll; his dress sword; a sandbag decorated for his 25th birthday, inscribed in bold ink: “To Charlie 5, 1st Battalion, 3rd Marines, Charlie Company, from The Dirty First,” one of Giannini’s rifle platoons. “I forgot my birthday that year. There were other things on my mind,” he said. There are weight machines, a stationary bike, a huge punching bag and sets of boxing gloves, two clothing racks with his Marine uniforms, a collection of Hawaiian shirts, and all the suits he wore during his legal practice. Every area of his life is represented here. His father, Victor, was a barber, a vet, a fighter on the street and in the ring. He instilled in his son a love of boxing, and was a principle force in his life, convincing him to go to college, and, after the Marine Corps, to Brooklyn Law School. His father eventually brought Mr. Giannini his first big legal case. One night, he told me, his father called and said he had his first case for him, and when he got to his father’s barber shop in Brooklyn, he learned it was a very high profile case involving a young girl who had been killed by a gang in the Bronx. He won that first case, but he encountered what he would come to know was systemic corruption in the legal system, what he called ‘serious misconduct,’ by the DA’s office and the detectives at the time. He told me things happened that were even worse, misconduct so unbelievable, people he told about it said it was impossible, that he was making it up. As a child, growing up in Canarsie, he worked summers for an uncle connected to some mob families, and as soon as he got into private practice they started calling him wanting representation, and he started representing them. “They knew me! I was Mike’s nephew! I tried about 50 murder cases in my career and I probably won, like 44 out of 50, maybe more. I don’t remember all my victories,” he said. 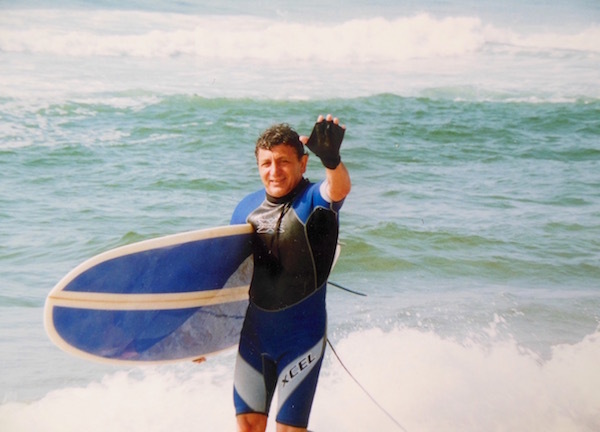 Mr. Giannini’s ways of dealing with the experiences of war and keeping the memories at bay when he came home were exercising, surfing and practicing law. After the war, most of the vets he knew couldn’t or wouldn’t talk about their experience unless they were talking to fellow Marines, he told me. He had run-ins during his years as a lawyer with vets he had known, and he refused to talk about their time in the service with them. In 1983, Vietnam veterans started a class action lawsuit against the chemical companies that produced Agent Orange, because they couldn’t sue the American government. Vets were receiving postcards urging them to enroll as plaintiffs in the lawsuit, and Mr. Giannini told me he got one. The case was settled for $180 million dollars, but the most any veteran received was $5,000. In 2002, after 30 years of keeping silent about his experiences in the service, he received all of the letters he had sent home from Vietnam. In a strange coincidence, his parents and his ex-wife sent them back in the same year. That summer, he sat down in his living room and read them. 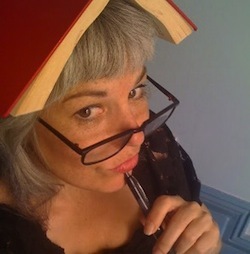 “I read through all of them. Boy, that was…” he shakes his head and his voice trails off as he can’t find the words he needs. That was also the year his wife, convinced her husband was living with undiagnosed PTSD, walked in one night and gave him an ultimatum. She wanted him to get some counseling and to sign up for a writing workshop. She slapped a brochure from Southampton College on the table in front of him. He didn’t fare well with the therapy, he told me. He was angry at his diagnosis of PTSD and still not ready to accept it. He wasn’t able to until 2010. “It was classic denial, nothing unusual about having PTSD and denying it, or being mentally ill, or addicted to drugs and denying it,” he said. But he loved the writing course. After a few weeks of preliminary assignments, their teacher instructed them to write about whatever they wanted, and to forget about the rules. In a week Joe came back with “Double Time Duffy,” his first real story. He sent it in to the East Hampton Star and they published it, followed over the years by dozens of his stories about Vietnam, published in The Star and in other publications, like the Connecticut Review, Surfer’s Path, Vietnam Veterans Against The War, and The Lincoln Eagle. By 2010, he was suffering so horribly, he told me, that he was ready to re-enter therapy. He also went to the VA for the first time and had a routine examination there that changed his life. The doctor called him out into the hallway to tell him he had an abnormally low heartbeat and extremely high blood pressure. “He didn’t say this could be because of Agent Orange. Nobody said anything to me,” he said. He was passing all of the tests they were giving him for his heart, but his wife was persistent and asked for the final test that revealed that he had approximately 90 percent blockage of the arteries leading to his heart. Open heart surgery was the only choice to avoid an imminent heart attack. After a disastrous surgery and difficult recovery in intensive care, he learned that his heart condition, Chronic Ischemic Coronary Heart Disease, is on the VA’s list of diseases caused by Agent Orange. “We had been battling with the VA already for a few years over my claims of PTSD and hearing loss, which they didn’t want to legitimize, but they told me I had this heart disease, and if you were in Vietnam it’s presumed Agent Orange caused it,” he said. It was still two years after his heart operation in 2015, before the VA finally agreed that he was permanently disabled and unemployable. “And it’s true! I am. I don’t understand anything in the courtroom. I don’t have any stamina left. I can’t even drive long distance,” he said. Mr. Giannini has severe PTSD, has had open heart surgery, stents, and a pacemaker put in recently; his hearing loss requires the use of hearing aids, but since his inner ear was damaged, the sound signal does not always translate into recognizable language when it reaches his brain. Mr. Giannini is very involved with Vietnam Veterans Against The War and Veterans Against The Iraq War. He uses his local cable television show on LTV, “Gung Ho”, as a platform for vets to talk about what is happening. Vietnam Veterans Against the War played a big part in the struggle to get the government to even admit that Agent Orange was causing diseases. Mr. Giannini tells me it took years and years and years, and tens of thousands of veterans died before they were paid for conditions caused by their exposure to Agent Orange. “They were coming home and dying real fast, with old men diseases like heart disease, liver disease, cancers, and their wives were having still-born births in a high percentage, and deformities in their children. It passes in our sperm! It’s just crazy,” he said. Many vets who put in claims for having the same disorders and diseases Mr. Giannini has died before their claims were legitimized. “They were denied and they died. Les Bennett, a friend and veteran out here, died this year from the same heart condition I have,” he said. Mr. Giannini told me that the night before our interview, he had been watching a Marine officer talk about the war in Afghanistan on television, and the officer said nothing, according to Joe, about the war, except the importance of having a clear mission. Mr. Giannini pointed out the absurdity of such a stance after 17 years. He put his head down for a moment. Mr. Giannini was so angry that he put his head down again, and finally laughed and apologized. Surfing is one of the few things that calms Joe Giannini’s mind. Dioxin, the chemical released when the two chemicals that comprise Agent Orange are mixed, Mr. Giannini said, is possibly one of the most deadly and dangerous chemicals ever. Dioxin is thought responsible for causing the deadly illnesses, still births, and deformities that are still happening generation after generation, here and in Vietnam. He explains that men and women who were exposed can pass it on to the next generation, and that men pass it along in their sperm. Finally now, the VA is paying hundreds of thousands of vets who were exposed to the chemical. But Monsanto is still producing products that contain half of the formula of Agent Orange, one of which, Round-Up, is being sprayed on our food crops. These days Mr. Giannini is writing regularly, about Vietnam, but also about the wild cases he encountered during his years as an attorney. One of his two sons, named Victor like Joe’s father, is a writer too, and someday hopes to turn his favorite of his father’s stories into a novel. 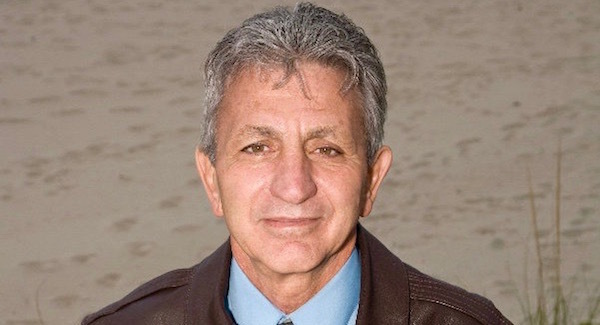 Mr. Giannini and his editor, Jennifer Farber are working on a joint project based on an adaptation of her novella, “ Beach Dreams,” about synchronicity and fate. Joseph Giannini’s show, Gung Ho, is on LTV at ltveh.org. I loved that piece on Joe Giannini. so thorough.